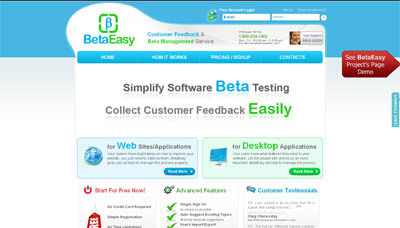 BetaEasy is online customer feedback and beta management service developed to make beta stage of any product (website, module, desktop application, etc) easier. This service allows to collect feedback from all the product users or separately selected group invited for testing in one place. It makes beta-testing process completely manageable which enables the developer to concentrate on the core tasks. BetaEasy enables to form the community of beta-testers who will test the product and leave feedback concerning bugs or functionality the product is missing. All feedbacks are collected in one place – which makes much easier for project owner to set the priorities e.g. what bugs should be fixed first. The users can vote for the bugs so the most urgent to be fixed bugs appear first on the list. BetaEasy is equally useful for web sites/applications as well as for classic desktop applications. Service helps you to built your own community of users who will cooperate with you and contribute to your website/software improvement. All feedback is collected in one place, priorities are clearly identified, feedback is turned into improvement.